Can a bed transform itself to suit any sleeper’s exact preferences? That may seem like a tall order, but Luxi didn’t back down from the challenge. Combining years of mattress industry experience with an education in engineering, Luxi’s founders set about the task of creating a bed that reinvents itself to suit the specific needs of each shopper. This product streamlines the manufacturing process and simplifies the bed’s features to create an affordable, simple option alongside the company’s flagship 3-in-1 Adjustable Mattress. 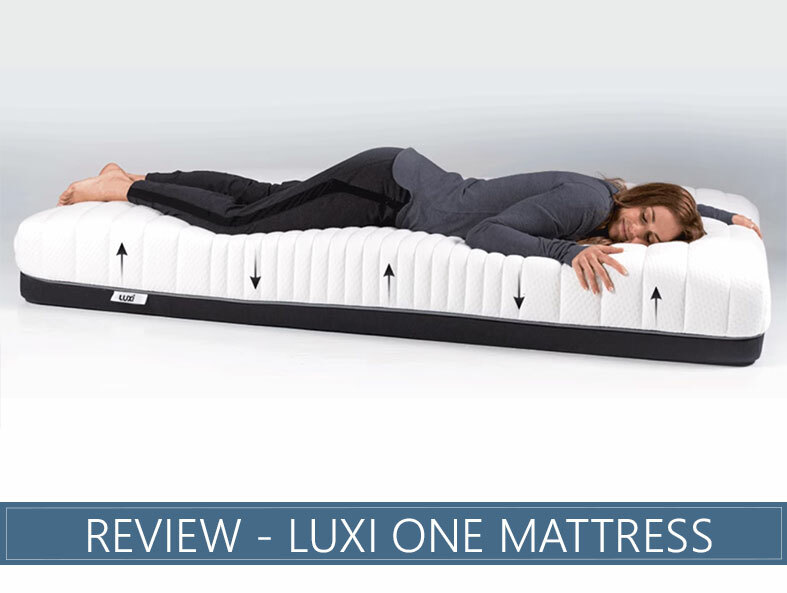 Our in-depth overview of Luxi One will look at the unique Shape-Changing Technology inside this mattress and how it conforms to you for a sleep experience that best suits your specific needs and preferences. We will also provide rankings based on Firmness, comfort, quality, and more. Check out the full review below for a comprehensive analysis of this product’s unique features and learn who it is best-suited for. Or skip to the end for our overall rankings and impressions of this bed. Like to float on top of the bed – Everyone experiences sinkage differently based on weight or position preferences. However, most people should find that they float close to the top of the mattress due to the light, springy Dunlop Latex. Slightly deeper cradling in heavier areas such as the hips should provide neutral spinal alignment. Are a combination sleeper – Enhanced bounce and customizable support, combined with a Medium feel should keep you feeling comfortable in any position while ensuring you can move around with becoming stuck in the comfort layers of the bed. Want excellent edge support – Minimal compression should be evident when lying or sitting on the edge, allowing for maximum use of the sleep surface. This should make this an ideal product for couples or those who like to sleep along the edge of their bed. Like a traditional Memory Foam feel – The Shape-Matching Technology should behave similarly to individually pocketed coils with a softer feel and the comfort layers are springy like Latex. This should provide a hybrid-like feel that is buoyant and airy. If you want, you can see our full list of top rated beds for 2019 here & explore some other options. This is an all-foam Dunlop Latex and Visco-Elastic Foam bed-in-a-box product. This mattress is compatible with most frames, including slatted bases, adjustable frames, and the floor. The breathable poly viscose, elastane cover should feel soft and cool to the touch. The cover is designed to move heat away from the body to allow for a cooler sleep experience. The total height of this mattress is 9 inches. The first layer is comprised of one LuxiTex, a proprietary open-cell synthetic Dunlop Latex that has been aerated to promote airflow. This material should feel springy and supportive. The second layer contains 2.25 inches of Luxi’s exclusive Shape-Matching Technology. This is comprised of Visco-Elastic Foam columns that should behave like individually pocketed coils, adhering to your body shape for personalized support that also relieves pressure. The third layer consists of 5.75 inches of Sturdy Base Foam that is intended to provide strong and stable support throughout the entire foundation of the bed. We rank the One mattress at a 5 on our Firmness scale where 1 is soft as a feather and 10 is rock-hard. This Medium comfort level, combined with the personalized pressure relief, should make this bed a great fit for most sleep positions. Sleepers may notice minimal cradling when lying on top of the mattress. Floating on top should allow more air to reach the body, helping to eliminate overheating. Some light contouring may be felt through the Shape-Matching Technology beneath the upper comfort layer. The proprietary comfort layers in this product should behave like Latex with spring and bounce. They should feel quick to respond, allowing for the comfort layers to reform quickly and easily as you move around. The quick response springy bounce should make repositioning very easy, while the customizable support columns should keep the spine neutral in any position. This should make this product a good fit for combination sleepers. Back sleepers should notice good lumbar support as the columns adjust to suit their bodies. This customization should provide a comfortable feel for shoppers of most shapes and sizes. Most side sleepers should feel adaptable pressure relief that removes too much pushback as the heavier body parts compress into the comfort layers. This should help to remove aches in pains in areas such as the hips and shoulders. Stomach sleepers may experience some slight sinkage in the hips, but most should find that the adjustable support keeps their spine neutral and well-aligned. Thanks to the personalized support offered by this mattress, most sleepers should find this product well-suited to their needs. 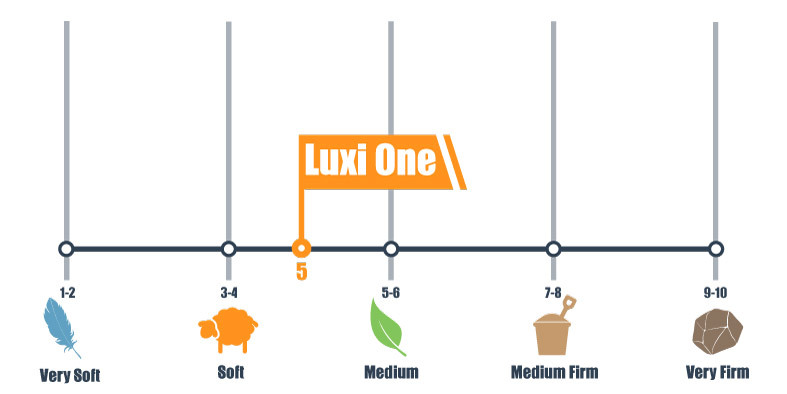 Those who prefer a Softer or Firmer experience can check out Luxi’s Adjustable Mattress, which can be customized to suit their comfort needs. While there is no weight limit for this bed, the company does recommend the original Luxi 3-in-1 for sleepers between 230-350 pounds so they can customize for a Firmer, extra supportive setting. 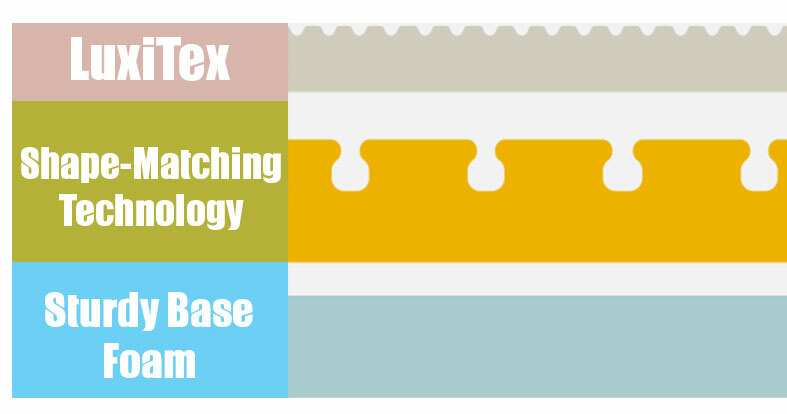 Latex often absorbs energy, while innerspring products tend to transfer a lot of vibration throughout the mattress. As the columns in this bed are made of foam, they help to reduce movements, along with the Latex layer. Co-sleepers should notice minimal motion transfer, which should help to reduce disruption from restless partners. Most all-foam beds display compression when lying or sitting on the edge. This is also noticeable in the Luxi One, though this product seems to perform a little above average in this area. This should help sleepers to feel a little more stable when utilizing the entire surface of their bed, making it a great choice for co-sleepers. Trial Period – Luxi offers a 100-night trial for this product. Warranty – The ONE bed comes with a 10-year warranty. Shipping – This item ships free in the United States, an extra fee can be added to ship to Canada. CertiPUR-US® Certified – This product is certified to contain safe levels of materials such as lead or mercury. The personalized pressure relief, enhanced edge support, and universal comfort feel should make this a strong choice for people of all preferences, especially couples. Luxi believes good days start with a good night’s rest … and they’re not wrong! That’s why they’ve put so much effort into designing a line of products that is completely adaptable to your own individual preferences and needs. With pressure relief that reacts to the weight and shape of your own body, enhanced motion isolation, and excellent edge support, this mattress promises to check off all of your top mattress shopping priorities. This bed stands out for its exceptional versatility and ability to appeal to shoppers of all kinds.